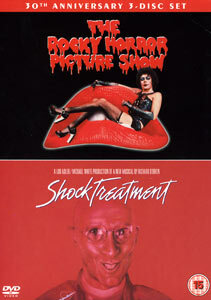 As well as the "Lips" Box Set release, there is also a double disc release of The Rocky Horror Picture Show and Shock Treatment available. Billed as the 30th Anniversary 3 Disc Set this is just the DVD's that appear in the Collectors Box Set. Priced at a suggested retail of £24.99. You get exactly the same two disc Special Edition Rocky Horror Picture Show disc and single Shock Treatment discs as featured in the Box Set, but this time they are in a small cardboard slip case to hold the two discs together. When the Rocky Horror Picture Show itself was released as a double disc edition it was £24.99 alone. All DVD images ©1975 Twentieth Century Fox Film Corporation. All Rights Reserved. © 2006 Twentieth Century Fox Home Entertainment, Inc. All Rights Reserved.